I know many people still wonder how do persons with visual impairment access computers and mobile phones because one has to see what appears on the screen. A couple of years ago, I was chatting with one of my friends on WindowLife Messenger and suddenly she asked me, “who is typing for you?” She did not believe me when I told her that I was typing myself. I know she was quite hesitant to chat with me because she thought there was somebody else beside me to read her messages to me and type my responses to her on my behalf. Well, it’s normal for anybody who has not been with a visually impaired person for sometime to wonder how computers can be accessed without sight. But for my colleagues in the office and some close friends, it’s no longer a mystery. Rikku Dhan Subba had advised me to write about how do I access computers because many people still wonder how it is possible. So today, I am going to briefly present how advanced science and technology has opened our doors to the virtual world which was once totally inaccessible to us. Thanks to the invention of screenreaders that make computers and mobile devices talk. All computers today come with the in-built speech synthesizer called “narrator” which announces the basic features that appear on the screen but it cannot be a replacement for a screenreader because it does not read everything that appears on the screen. I use “narrator” only to install my main screenreading software called “JAWS” because it allows me to install the program independently until JAWS begins to talk. I no longer need the assistance of a sighted person to install JAWS on my computer. Freedom Scientific is expensive but it is the most widely used screenreader in the world today. With the help of JAWS, a visually impaired person can do almost everything on the computer: creating, editing and saving documents, internet surfing, accessing social media, play accessible games and even work on audio-visual programs. It reads whatever that appears on the screen and we have keyboard shortcuts to do almost everything through the keyboard. Using mouse still poses some challenges but we have enough keyboard shortcuts to compensate the use of mouse and they are faster as well. So, it is JAWS that has been helping me do all my office works and it’s just amazing. I am so used to it that I don’t have to repeat the lines to understand every word it reads. I tried to use another screenreader called “NVDA” which is a free program developed in Australia but I did not feel very comfortable. So, I had to switch back to my dearest friend “JAWS”. This is how I access my computer. Now coming to the mobile phone, I am using IPhone which comes with the in-built screenreader called “Voice-over” which can be found in: setting-general-accessibility-voice over. Once you turn it on, the device starts to talk. But once it starts talking, you need to tap twice on the icon to activate it because it is designed to help a blind person know where he/she is focusing on before activating a particular icon on the screen. It’s great that all Apple products come with adequate accessibility features for all types of disabilities. There is no need to install any separate speech synthesizer unlike other devices. Until a couple of years ago, I was using a Nokia phone in which I had to install a screenreader called “Talks” developed in the UK to make the device talk. It was equally accessible but unlike the Apple device, the screenreader had to be installed separately. So, with all such developments, I no longer feel disadvantaged because I am getting equal opportunities to reap the benefits of modern technological revolutions. However, while screenreaders are making it possible for us to execute so many tasks on a computer including accessing the internet resources, there still has to be a public awareness on the importance of bearing in mind the need for accessibility while designing anything. 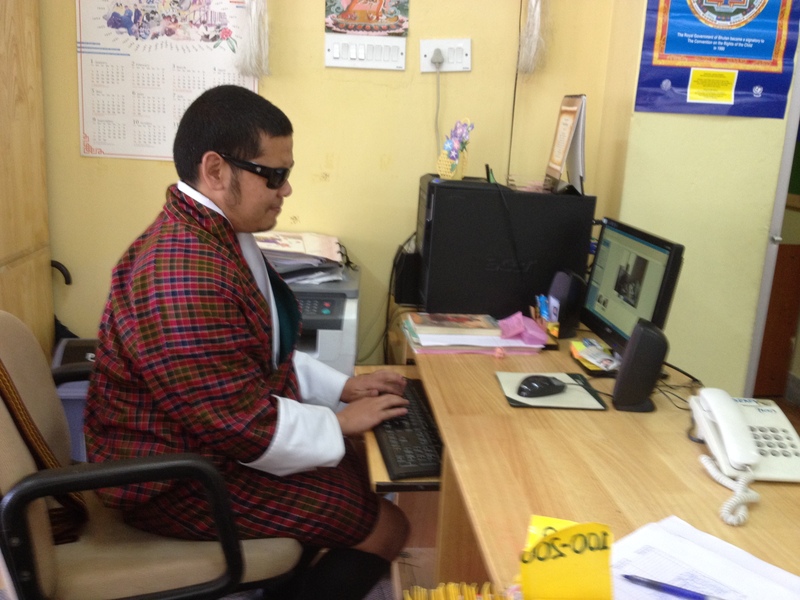 For instance, some websites in Bhutan are not fully accessible with screenreaders because they are fully graphic-based and no alternative text descriptions are provided. So, if the web designers could design more accessible sites, JAWS can read anything to us. Another good thing I have recently discovered is that now I can read even a scanned PDF document with JAWS and now I no longer have to let somebody else read it for me everytime I get a hardcopy document. I can just scan it on my computer in PDF and read it with JAWS. With such technologies in place, life for me has become so easy today that I hardly feel I am blind. Thanks to advanced science and technology! I am happy to see that this post has come up finally. So happy to know that you can even read pdf document. Good night and see you tomorrow. Thank you for your comment, Riks! Goodnight to you too, and see you tomorrow. I too have been wondering on this since I came to know about you and your blog. To be frank, I also thought just like your friend. But now I came to know. Thanks sir. Indeed technology advancement has also helped VIP in greater ways. Takecare sir..
Amrith sir, happy to hear from you. It's worth shedding light on it as many people don't understand and are being blurred by clouds surrounding it. Thanks for the share. This was an enlightening read. Many years ago, in college, a group of friends and I had created a software wrapper which would allow those who are visually impaired to use a PC and send e-mails. We called it VIVA (Virtual Interactive Visual Aide) and it was a very basic software. Today my work has taken me away from user interaction tools, but after reading your blog I wish I was more passionate in creating a better platform to help people in my youth, I also wish that professors in colleges would encourage their students to create socially responsible software. We live in a world where the vast majority of people take sight, sound, independent movement and freedom of thought for granted. I hope that things will gradually improve. Thank you so much for your encouraging comment. I am glad that you have had made a great contribution during your college days for the benefit of visually impaired people. We want many more such good souls who can work towards creating an inclusive society in which we all can live in harmony. Once again, thanks a lot for your encouragement. Celebrating my birthday in the virtual world! Transience of human life, as Nature demonstrates!